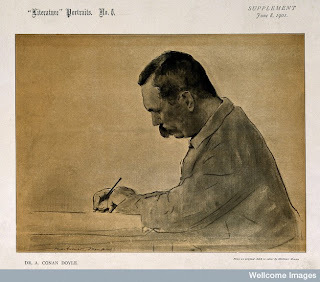 We started 2010 with a post on material from our collections which had been opened under the Data Protection Act, on the case of Charles H.M. Kerr: from our records, patient of Manor House Asylum in Chiswick, but identified – after a little detective work of our own – as illustrator of some of Conan Doyle’s Sherlock Holmes stories. Now, on the day of the 80th anniversary of Sir Arthur Conan Doyle’s death, we can announce the release of material with a more direct connection to Conan Doyle himself: letters written by Sir Arthur himself. Whilst relatively minor pieces of correspondence, these letters have made us ponder the other material in the Wellcome Library’s collections with a link to Conan Doyle: clues that when put together offer a portrait of the creator of the most famous of all fictional detectives. Starting with the facts, a simple search on the Wellcome Library catalogue reveals a number of works on Conan Doyle. These range from biographical works to journal articles examining his career and the influences upon it. Conan Doyle was a medical man, of course, training at Edinburgh University Medical School, seeing service as a ship’s doctor on a Greenland whaler and later working as a general practitioner in both Plymouth and Southsea. His attempts to set up himself as a specialist in eye-surgery in London in the 1890s did not have great success, but by this stage in his life, his career as a writer – through the creation of Sherlock Holmes and Dr John Watson – was beginning to bear fruit. 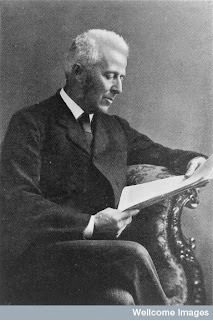 Famously, the analytic deductive powers of Holmes appear to have (at least in part) been based on Dr Joseph Bell, professor of Clinical Surgery at Edinburgh University during Conan Doyle’s days as a student. 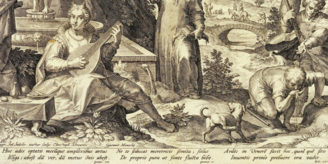 And for those who want to see if Bell’s powers of reason come through in his publications, a number of Bell’s works are held in the Wellcome Library. Always rather in the shadow of Holmes is the stories narrator, Dr John Watson – again, another man of medicine. From the Holmes stories, we know that Watson picked up a war wound whilst serving as a Military Doctor in Afghanistan, and literary detectives have attempted to ascertain at which precisely which battle. In the Wellcome Library, the Royal Army Medical Corps Muniments Collection contains letters and diaries from fellow military doctors who served in the same campaigns, so offering up the voices of real-life Dr John Watsons. One of the other threads of medicine running through the Holmes stories is drug use – often that of Holmes himself. 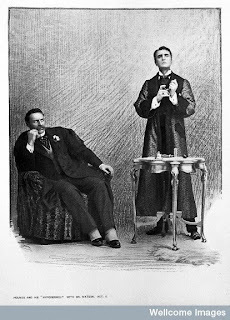 The Sign of Four memorably starts with Holmes injecting himself with cocaine, and this image of a stage portrayal of Holmes and Watson’s adventures, illustrates Holmes’ far-away gaze and Watson’s tense consternation at his friend’s activities. Towards the end of his life Conan Doyle became fascinated with Spiritualism, and for some fans of his work, this sits uneasily with his creation of the eternal rationalist Holmes. The Wellcome Library’s collections do encompass a range of works on Spiritualism, helping to assess and understand why the movement was so successful in the late nineteenth century and early twentieth century. And his interest in Spiritualism takes us back to Conan Doyle’s death in 1930. As we wrote above, he died 80 years ago today. But, six days later, at a packed seance in the Royal Albert Hall, the medium Estelle Roberts declared the spirit of Conan Doyle had returned and was sitting in – to the eyes of unbelievers – an empty chair on stage. Whether such evidence bares out Holmes’s famous dictum – “Once you eliminate the impossible, whatever remains, no matter how improbable, must be the truth” – we will leave for others to judge.